When her little brother Martin experiences the same events that once tested her sanity, Rebecca works to unlock the truth behind the terror, which brings her face to face with an entity that has an attachment to their mother, Sophie. Does filmmaker James Wan ever sleep? Apparently not, as he seems to work on approximately 78 movies every year. Okay, that number acts as an obvious exaggeration, but Wan does appear to be ubiquitous, and why not? His movies make money, so strike while the iron is hot and all that! Apparently Wan “only” worked on two 2016 releases. He directed the successful sequel Conjuring 2 and he finds himself as a producer of Lights Out, another scary story. Here director David F. Sandberg reworks his own 2013 short film. After closing at his textile factory, owner Paul (Billy Burke) comes under attack by a mysterious entity that must always remain in the shadows. When the lights cut out, this creature kills Paul in a bizarre and gruesome manner. Paul’s wife Sophie (Maria Bello) suffers from mental issues and she talks to what appears to her apparently imaginary “friend” Diana. However, her son Martin (Gabriel Bateman) actually sees Diana and the experience leaves him with insomnia. Sophie’s adult daughter Rebecca (Teresa Palmer) went through similar concerns as a child, so she identifies with her half-brother Martin. In the face of Diana’s supernatural threat, Rebecca works to protect the boy and come to terms with the family legacy. I’ll say this for Lights Out: at least it doesn’t overstay its welcome. The flick runs less than 81 minutes, which makes it about as short a feature film as you’ll find. After the 134-minute endurance test presented by Wan’s Conjuring 2, I appreciate this effort’s brevity. A brisk running time doesn’t automatically make a film good, of course, so the bigger question becomes whether or not Lights Out brings anything new to the genre. I’d say yeah – maybe. I don’t think the movie offers great innovation but it manages to create a decent horror tale. Much of the film’s appeal comes from its simplicity. Granted, no one can call a supernatural entity that focuses its attacks on one family a new idea – in fact, it’s been done to death. 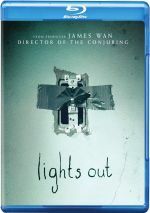 Still, Lights Out gives this theme a reasonable twist, especially in the way it presents Diana’s “origin story”. Usually these movies involve ancient curses or the like, but Lights Out manages to make things more personal – and logical, in a freaky fantasy manner. It helps that the actors invest in their parts. None of them behave as though they look down on the material, so even when the story threatens to become silly or go off the rails, the cast members ground matters and communicate a solid sense of danger. I admit that most modern horror movies leave me cold, but Lights Out manages to become a mostly enjoyable effort. While I don’t think the film offers a great effort, it accomplishes most of its goals. Lights Out appears in an aspect ratio of approximately 2.40:1 on this Blu-ray Disc. This was a consistently terrific presentation. Sharpness was tight and concise, with virtually no softness on display. This meant a well-defined image at all times. Jagged edges and shimmering failed to appear, and no artifacts or edge haloes marred the presentation. The movie suffered from no print flaws either. Colors were positive. The palette emphasized amber and green tones, and those came across in appropriate fashion. Blacks looked deep and full, while low-light shots offered nice clarity. Really, everything about the image succeeded. Expect a pretty standard “horror mix” from the film’s DTS-HD MA 5.1 soundtrack. Much of the movie went with creepy atmosphere and the occasional jolt effect. These elements cropped up from the side and rear speakers in a satisfying manner, as they were well-placed and gave the movie the requisite scare moments, mainly via Diana’s scratching. Music also boasted good stereo presence and contributed to the expected scary bits as well. Audio quality excelled. Speech was always distinctive and concise, without edginess or other issues, and music seemed fine. The score was bright and bold; louder stings demonstrated very nice punch. Effects were terrific. They sounded accurate and dynamic, with strong bass response. This track didn’t reinvent the horror wheel, but it more than satisfied. Three Deleted Scenes run a total of 13 minutes, 58 seconds. The first two run two minutes, two seconds, respectively, and they offer a little more exposition about characters. Neither seems necessary. The third segment lasts nine minutes, 26 seconds and brings us an alternate ending for the movie. It’s an interesting take but not one that seems especially effective. The disc opens with an ad for The Accountant. No trailer for Lights Out appears here. Although I can’t claim that Lights Out manages a fresh, innovative take on the horror genre, it does craft a compelling tale. The actors sell the material and allow it to become creepy and effective. The Blu-ray offers very strong picture and audio but it skimps on supplements. In a field packed with cheap scares, Lights Out manages some genuine fright.